MOWING is in Peak Crossing boy Eithen Leard's blood. His father Brett loves it, his grandfather loved it, and six-year-old Eithen loves it. However, Eithen was born paralysed from the waist down with an undiagnosed spinal cord injury. "He was always asking what he could do to help out around the house," Mr Leard said. 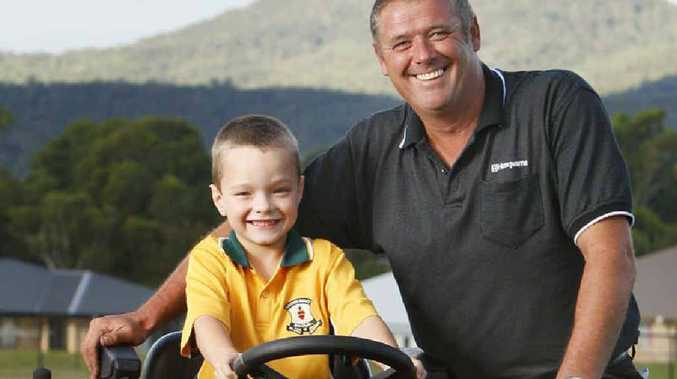 In order to let Eithen mow, and give him some much needed independence, Mr Leard employed the assistance of Yamanto Mower and Garden owner Marcus Page. Mr Page converted a standard ride-on mower to be operated entirely by hand. He added levers for Eithen to access the brakes, and arm rests to help keep him safely on the seat. Mr Page said the upgrades to the mower would let Eithen help his dad around the property. "We've basically converted a standard ride on mower into a paraplegic friendly mower. "It's safe for him to get around on." Mr Leard said Mr Page had gone out of his way to help. "I went to a lot of different stores and these guys were the only ones that really offered to help," he said. "Marcus gave a lot of his own time to do this. "Eithen used to love being carried around while we mowed with the push mower, but he just got too heavy to carry for long. "This mower is going to let him help out like he's always asking to, and gives him some independence as well. "He's such a bright energetic boy, it's going to be a great thing for him. He's always asking what he can do to help us, and with this he's got something only he can do."